Intended to take runners away from the roads and city streets, trail running is all about embracing and experiencing the outdoors combining elements of cross country running with a wide range of terrain that needs to be traversed, from gentle slopes to steep inclines. These often require hiking or scrambling to get over as trail running can take place virtually anywhere from rolling hills to rocky mountain paths or dense forest trails. With the growing speed that Great Britain is returning to outdoor pursuits, trail running has quickly developed a large following amongst runners, walkers and all forms of outdoor enthusiasts. In 2006 the annual Lakeland Trails became the world's biggest trail running series with other 300 competitors. The courses which run through the Lake District National Park are well marked and marshalled along environmentally sustainable bridleways and footpaths, taking runners through some of the most stunning scenery that England has to offer. Usually an individual sport where everyone runs for themselves, trail running can be an organised trail races or a recreational activity commonly 5 km to 30 km in distance. However, some trail races do run even further with ultramarathon trail races being a rarity. But what makes a trail race so appealing is the opportunity to take in the surroundings in relative solitude. Due to the small number of participants, the odds of running along without another competitor in sight are very likely. As a result, runners have to rely on their own inner resolve to complete the course as there is limited crowd support along the courses. However, the countryside has a very therapeutic effect and it seems the more of the scenery a person takes in the better the effects. 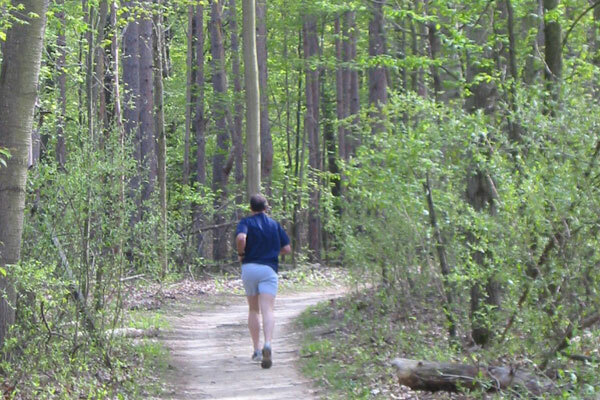 Hence why a trail runner will experience far more of the countryside than a walker during the same space of time due to the speed and distance travelled. In order to tackle all types of terrain, a trail runner will need a suitable pair of trail running shoes. Typically, a trail running shoe is based on an already successful road running shoe but with the level of cushioning reduced in favour of a protective outsole to prevent rocks and other sharp objects from damaging the foot. This same outsole will also be designed to provide better grip for running on a wide range of surfaces. Prior to the creation of trail running, fell running was also very popular, especially in the Lake District. As a sport almost exclusive to the UK, fell running could be considered a far more demanding form of trail running. Also known as mountain running and hill running; fell running is all about running off road, across upland country where steep gradients provides the biggest part of the challenge, let alone getting lost. As such, there is often a difference between trail running shoes and fell running shoes with fell running shoes often providing greater stability and ankle support for conquering all manner of obstacles and very steep inclines. For this reason, fell running shoes often resemble outdoor shoes such as walking shoes and hiking boots in design. Some fell runners have even taken to using ultra lightweight hiking poles to increase their speed and stability. However, these are often not allowed during competitions. But unlike trail runners, fell running participants will be expected to possess mountain navigating skills, while carry an array of essential survival equipment. Not only are courses usually longer and steeper, they are often unmarked, which forces fell runners to choose which route to the next check point would be best. The runner's decision will typically depend on the weather, visibility, surface conditions and their ability to ascend at that point in the race. Generally most fell runners start out as trail runners and progress to fell running once they have developed their level of fitness and experience traversing steep inclines and difficult terrain. So with another beautiful British summer on the way, it's safe to say that trail running will remain a very popular sport for years to come and there's no better place to experience it than in the Lake District.